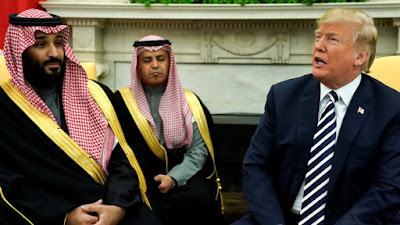 Today the president of the United States released a statement reaffirming his support for Saudi Arabia and its regent, Crown Prince Muhammad bin Salman, known as MbS. The process of separating the substance of the document from its mortifying semiliteracy took me approximately 15 minutes, but I think I managed it without permanent damage to the Broca region of my brain. . . . . Here’s what close study reveals. We knew—we always knew—that Donald Trump would never ditch an ally who would always support him as long as he reciprocated with loyalty of his own. MbS is such an ally. Recall that Trump’s first foreign trip was to Saudi Arabia, a curious choice for a president widely believed to hate and distrust Muslims. . . . . The affirmation of this relationship should be read not as the product of deliberation but as an exercise in apologetics: an explanation of a decision that was never in doubt, even if the explanation proved inadequate. All of Trump’s romances are like this. That is why his supporters love him; he loves them back unconditionally—whether they are racist or murderers or cretins. Trump begins with a foreboding message. “The world is a dangerous place!” he writes, at his most Churchillian. He characterizes the war in Yemen as a “proxy” war in which the American enemy Iran and the American ally Saudi Arabia have met on a field of battle. . . . . The destruction and immiseration of Yemen, including the starvation of children and other civilians, is a price Trump regards as a good deal for the inhibition of Iranian interests. And then, finally, comes the matter of Khashoggi. On October 2, a team of Saudis murdered Khashoggi, almost certainly in the Saudi consulate in Istanbul. . . . The Turks caught the Saudis in an evil and inexcusable plot, one that (perhaps even worse) was executed with all the grace and competence of a team of howler monkeys on methamphetamines. The CIA recently leaked its own assessment, which stated that MbS ordered the Khashoggi operation. This leak was calculated to ensure that Trump’s semiliterate valentine to MbS would be maximally awkward, a love-letter to a killer. , , , , He adds that “our intelligence agencies continue to assess all information, but it could very well be that the Crown Prince had knowledge of this tragic event—maybe he did and maybe he didn’t!” This sentence is the ultimate transformation of the American government into a form of reality television. The CIA reports—you decide! Trump neglected only to tell readers how to register their votes. And here is the brutal truth behind this amoral love affair: MbS has done what America has asked. Fourteen years have passed since Michael Moore’s risible film Fahrenheit 9/11—long enough to erase America’s collective memory . . . . Saudi Arabia contributed 17 of the 19 hijackers on September 11; it encouraged jihadism while professing to be an American ally; it distorted American politics by wielding influence over the Bush family and the various corporate slaves to its oil industry. MbS has acknowledged that hydrocarbon feudalism is not a viable form of government for Saudi Arabia in perpetuity. He has laid off criticism of Israel. Crucially, he has undertaken massive economic and political change, precisely along the lines that were the basis of a liberal critique of Saudi Arabia a decade ago. That the implementation of this critique has occasionally taken a homicidal form may have seemed to MbS incidental. MbS has seemed wounded by the speed with which Western powers have dropped him—even after he has incarnated their fondest hopes for the modernization (and de-Islamization) of the Kingdom. He has alluded to a willingness to seek the friendship of China or Russia, if accession to every demand of the United States is not enough to maintain their relationship. But with Trump’s Tuesday statement he knows that the relationship is a safe one. “If you want a friend in Washington,” goes the adage, “get a dog.” With Trump’s statement we see that the genus Homo can be a more constant and loyal friend than found in any kennel. America has much ugliness in its past. Trump's actions have underscored the fact that at least in the White House, people have learned nothing from the horrors of the past and have willingly thrown away what little moral standing America may have had in the world. Taken from the ‘Totaliarianism For Dummies’ he got last Xmas.